I have my goals set for the next two months in my goal book (in an effort to improve myself & get things done!) 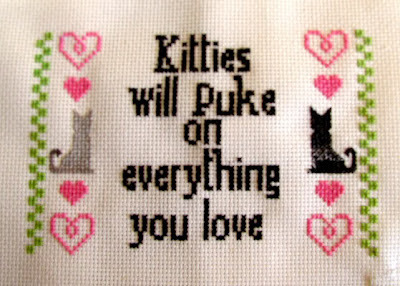 and for March one of my goals is to learn how to cross stitch. I bought a cheap-o kit over the weekend and sat down with it yesterday and took advantage of the leap year to get an early start. The pattern was not my thing, the kit was cheaply made and the instructions really poor. I decided to find some videos online and get started. I was bummed and told her how needle art is really cool - I don't think she believed me. Do people who work at big chain craft stores even craft? I know when I worked at a chain bookstore many years ago I was the only one who read books! I am glad I have other craft stores to choose from and once my cross stitch project is done I will cross it off my list and post it! Think needle art is lame? Think again! Here is some inspiration to start stitching! 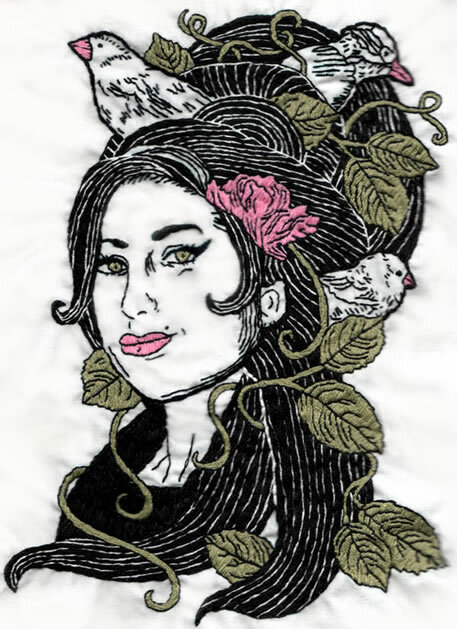 Amy Winehouse by Totally Severe - I dig on the hair detail! I love the playful birds nest 'do! Cat humor! There is even a chart for this one! Sublime Stitching is a go to for so much inspiration and a valuable pattern source. Also there are tips and free patterns on the blog! KittyKill - was the person I looked to when I fist started. 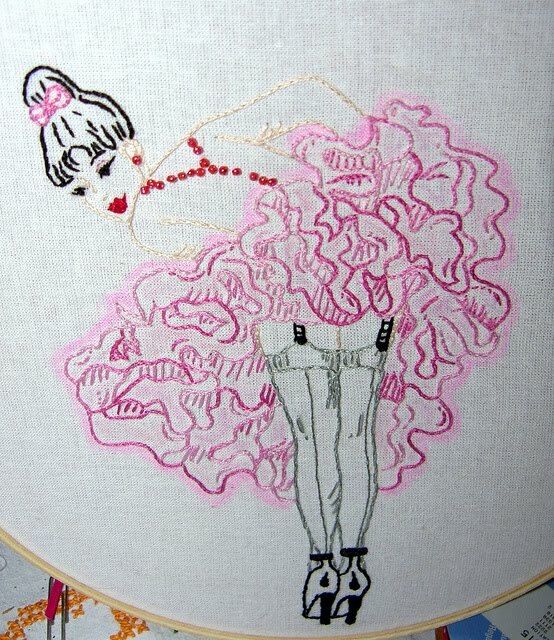 She just has a way about finding the best vintage patterns and she is all around crafty-awesome! Thank you so much for the awesome shout out! You rock my socks! These are all great! It's a shame that the craft store isn't going to be carrying the supplies like that anymore. I did cross stitch when I was a kid, but haven't in a very long time. One of the things that I loved about cross stitch, embroidery etc, was that it was so relaxing. With the stresses of work, family etc. Everyone needs a outlet to find peace and relaxation. 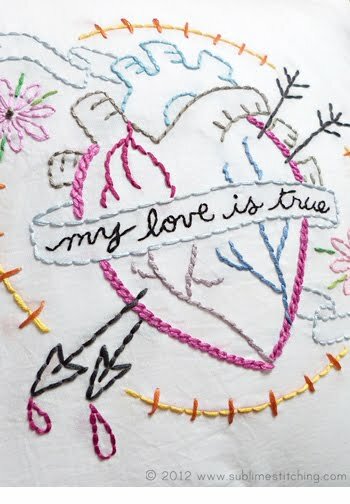 Needlework quietens the minds, it provides an escape from modern life. I am 28, and do much needlework. Do me a favour? Choose a pattern that you like- try some of these websites- guarantee, it will become apart of your everyday life. Take a look at my blog- if you like it, become a follower and I will email you a free cross stitch chart.